Kriti Sanon (born 27 July 1990) is an Indian actress who appears predominantly in Hindi films. Born and raised in New Delhi, she pursued an engineering degree from the Jaypee Institute of Information Technology, after which she briefly worked as a model. She made her acting debut with the Telugu psychological thriller 1: Nenokkadine (2014) and had her first Hindi film release in Sabbir Khan's action film Heropanti (2014), for which she won the Filmfare Award for Best Female Debut. Sanon went on to play the lead female role in two commercially successful films, the action-comedy Dilwale (2015), which ranks among the highest-grossing Indian films of all time, and the romantic comedy Bareilly Ki Barfi (2017). Kriti Sanon (born 27 July 1990) is an Indian actress who appears predominantly in Hindi films. Born and raised in New Delhi, she pursued an engineering degree from the Jaypee Institute of Information Technology, after which she briefly worked as a model. She made her acting debut with the Telugu psychological thriller 1: Nenokkadine (2014) and had her first Hindi film release in Sabbir Khan's action film Heropanti (2014), for which she won the Filmfare Award for Best Female Debut. Sanon went on to play the lead female role in two commercially successful films, the action-comedy Dilwale (2015), which ranks among the highest-grossing Indian films of all time, and the romantic comedy Bareilly Ki Barfi (2017). Kriti Sanon was born on 27 July 1990 to Rahul, a chartered accountant and Geeta, a professor at the University of Delhi. She has a younger sister, Nupur Sanon. She attended Delhi Public School, RK Puram and completed her BTech degree in Electronics and Telecommunication Engineering, from Jaypee Institute of Information Technology, Noida, Uttar Pradesh. Sanon made her acting debut in 2014 with Sukumar's Telugu film 1: Nenokkadine, a psychological thriller, in which she played the role of Sameera, a journalist who is also the love interest of Mahesh Babu's character. The film received mixed reviews from critics. A reviewer for The Times of India wrote that Sanon "looks pretty" and "acts well". while a reviewer for Sify.com stated that she "looks gorgeous" and considered her performance to be "okay" for a newcomer. Later that year, Sanon made her Hindi cinema debut, opposite Tiger Shroff, in Sabbir Khan's action romance Heropanti. Despite receiving mixed reviews from critics, it emerged as a commercial success. Taran Adarsh of Bollywood Hungama wrote that she "looks gorgeous and handles her part with certainty and confidence" and that she "has the trappings of a star", whereas Rajeev Masand said she "looks lovely and makes an impression despite her harebrained role". Conversely, Srijana Das of The Times of India criticised her emoting, calling it "more cheesy than sharp." For her performance, Sanon won the Filmfare Award for Best Female Debut. Sanon's second Telugu film release came with Sudheer Varma's Dohchay, a crime film co-starring Naga Chaitanya. She next appeared in Rohit Shetty's action-comedy Dilwale, in which she starred alongside Varun Dhawan, Shahrukh Khan and Kajol. The film received mixed reviews from critics, though emerged as one of the highest-grossing Indian films of all time, grossing more than ₹3.72 billion (US$52 million) worldwide. Anupama Chopra disliked the film and wrote that Sanon and Dhawan "work as bait, meant to bring in the critical youth segment". Sanon had two film releases in 2017. She first starred alongside Sushant Singh Rajput in Dinesh Vijan's directorial debut Raabta, which tells the story of star-crossed lovers who are reincarnated. In a scathing review, Sukanya Verma of Rediff.com labelled the film "embarrassingly daft" but took note of Sanon's "statuesque, spirited presence". It did not do well commercially. Her next release, Ashwiny Iyer Tiwari's romantic comedy Bareilly Ki Barfi, was better received. Sanon starred alongside Ayushmann Khurrana and Rajkummar Rao and played the role of a headstrong woman in rural India who aspires to a better life. Saibal Chatterjee of NDTV noted that "the burden of making Bareilly Ki Barfi work rests upon Kriti Sanon and she doesn't put a foot wrong", but Shubhra Gupta of The Indian Express thought that despite Sanon's effort, her performance lacked naturalism. It earned over ₹548 million (US$7.6 million) against its ₹200 million (US$2.8 million) budget. In 2019, Sanon will star opposite Kartik Aaryan in the romantic comedy Luka Chuppi and alongside Diljit Dosanjh in the romantic comedy Arjun Patiala. She will then star in the comedy sequel Housefull 4. Sanon will also star alongside Arjun Kapoor and Sanjay Dutt in Ashutosh Gowariker's period drama Panipat. In addition to acting, Sanon is an endorser for several brands and products, including Trident Group's Bath & Home Linen, Titan Watches' Raga Collection, the hair product Parachute, apparel brand American Swan and a cola brand, among others. In July 2014, Sanon launched Tissot's Quickster Football watch in multiple cities in India. In April 2017, she performed in the opening ceremony of 2017 Indian Premier League. Kriti Sanon has also taken up the role of being a Brand Ambassador for Education New Zealand as their India Influencer. N/A Special appearance in song "Aao Kabhi Haveli Pe"
↑ Parkar, Shaheen (8 May 2016). "Mother's Day Special: Meet the star moms of Bollywood". Mid-day. Archived from the original on 10 June 2016. Retrieved 5 June 2016. ↑ "Kriti Sanon". One India Entertainment. Archived from the original on 2 July 2014. Retrieved 31 May 2014. ↑ Mangaokar, Shalvi (27 July 2015). "Varun Dhawan and I think in the same filmy way: Kriti Sanon". Hindustan Times. Archived from the original on 31 May 2016. Retrieved 17 April 2016. ↑ "Dilwale: Will start shooting with Shah Rukh and Kajol in mid-August, says Kriti Sanon". India Today. 29 July 2015. Archived from the original on 28 April 2016. Retrieved 17 April 2016. ↑ Sharma, Garima (18 March 2010). "Ticket to Bollywood". The Times of India. Archived from the original on 12 May 2015. Retrieved 5 June 2016. ↑ Chakravorty, Vinayak (14 June 2015). "Engineering student Kriti Sanon says life in B-Town was meant to be". India Today. Archived from the original on 22 April 2016. Retrieved 5 June 2016. ↑ "Most Wanted: Kriti Sanon has her kitty full with movies". India Today. 26 January 2013. Archived from the original on 19 November 2013. Retrieved 22 December 2013. ↑ "Ticket to Bollywood". The Times of India. 18 March 2010. Archived from the original on 13 May 2014. Retrieved 12 May 2014. ↑ "Mahesh Babu to romance Kriti Sanon". The Times Of India. 5 October 2012. Archived from the original on 6 July 2015. Retrieved 22 December 2013. ↑ "'1 Nenokkadine' Review Roundup: Mahesh Babu Starrer Fails to Live up to Expectations". International Business Times. Archived from the original on 15 January 2014. Retrieved 2 April 2014. ↑ Sangeetha Seshagiri (12 February 2014). "'1 Nenokkadine' Box Office Collection: Mahesh Babu Starrer is a Big Disaster". International Business Times. Archived from the original on 6 July 2015. Retrieved 27 May 2014. ↑ "1-Nenokkadine Movie Review". The Times of India. Archived from the original on 20 January 2014. Retrieved 2 April 2014. ↑ "1 Nenokkadine". Sify. Archived from the original on 1 April 2014. Retrieved 2 April 2014. ↑ "Kriti Sanon finalized opposite Tiger in Heropanti". Bollywood Hungama. Archived from the original on 13 June 2014. Retrieved 2 April 2014. ↑ "Telugu actress Kriti Sanon to act opposite Tiger". The Times Of India. 21 January 2013. Retrieved 22 December 2013. ↑ "Heropanti Cast & Crew". BollywoodHungama. Archived from the original on 4 April 2014. Retrieved 2 April 2014. ↑ "Heropanti Set To Emerge A HIT". Box Office India. Archived from the original on 28 May 2014. Retrieved 27 May 2014. ↑ Adarsh, Taran (23 May 2014). "Movie Review: 'Heropanti'". Bollywood Hungama. Archived from the original on 7 June 2014. Retrieved 4 June 2014. ↑ Masand, Rajeev (23 May 2014). "'Heropanti' review: Tiger Shroff is likeable and earnest but he deserved a better debut than this clunky film". CNN-IBN. Archived from the original on 29 May 2014. Retrieved 5 June 2016. ↑ Das, Srijana (23 May 2014). "Heropanti Movie Review". Times of India. Archived from the original on 30 August 2017. Retrieved 5 June 2016. 1 2 "60th Britannia Filmfare Awards 2014: Complete list of winners". The Times of India. 31 January 2015. Archived from the original on 3 February 2015. Retrieved 31 January 2015. ↑ "Naga Chaitanya's new movie regular shooting from today". India Glitz. 14 July 2014. Archived from the original on 22 November 2014. Retrieved 27 July 2014. ↑ Groves, Don (20 December 2015). "'Dilwale' Easily Wins The Battle Of The Bollywood Blockbusters". Forbes. Archived from the original on 5 March 2016. Retrieved 24 February 2016. ↑ Chopra, Anupama (19 December 2015). "Dilwale review by Anupama Chopra: This is just recycled mediocrity". Hindustan Times. Archived from the original on 26 March 2016. Retrieved 5 June 2016. ↑ "Raabta: It's splitsvilla for Sushant Singh Rajput and Kriti Sanon". Hindustan Times. 23 March 2017. Archived from the original on 14 April 2017. Retrieved 14 April 2017. ↑ Verma, Sukanya (9 June 2017). "Raabta Review: Rom-com, Rebirth and Mr Right crisis". Rediff.com. Archived from the original on 16 January 2018. Retrieved 2 August 2018. ↑ "Raabta flops at the box office". Rediff.com. 12 June 2017. Archived from the original on 18 January 2018. Retrieved 2 August 2018. ↑ "Ayushmann Khurrana and Kriti Sanon relish 'Bareilly ki barfi'!". The Times of India. 29 January 2017. Retrieved 14 April 2017. ↑ Chatterjee, Saibal. "Bareilly Ki Barfi Movie Review: Kriti Sanon Makes This Sweet Concoction Work". NDTV. Archived from the original on 25 November 2017. Retrieved 2 August 2018. ↑ Gupta, Shubhra (18 August 2017). "Bareilly Ki Barfi movie review: This Rajkummar Rao, Ayushmann Khurrana and Kriti Sanon film works in fits and starts". The Indian Express. Archived from the original on 13 January 2018. Retrieved 2 August 2018. ↑ "Bareilly Ki Barfi". Box Office India. Archived from the original on 21 January 2018. Retrieved 2 August 2018. 1 2 "Arjun Patiala was such an exciting journey: Kriti Sanon". The Indian Express. 15 May 2018. Archived from the original on 17 June 2018. Retrieved 2 August 2018. ↑ "Kriti Sanon joins Akshay Kumar and Riteish Deshmukh starrer Housefull 4". The Indian Express. 22 March 2018. Archived from the original on 2 July 2018. Retrieved 2 June 2018. ↑ India, Press Trust of (22 March 2018). "Kriti to be part of "Housefull 4", 2 more actresses to join her". Business Standard India. Archived from the original on 2 July 2018. Retrieved 2 June 2018. ↑ "Arjun Kapoor, Sanjay Dutt and Kriti Sanon all set for Ashutosh Gowariker's 18th century battle film – Panipat". Bollywood Hungama. 14 March 2018. Archived from the original on 14 March 2018. Retrieved 14 March 2018. ↑ Business of Cinema News Network (11 July 2014). "Kriti Sanon Bags Two Endorsements". Business of Cinema. Archived from the original on 13 July 2014. Retrieved 11 July 2014. ↑ "Sidharth Malhotra and Kriti Sanon heat up the dance floor in #ASIAM". The Times of India. 27 March 2015. Archived from the original on 3 April 2015. Retrieved 5 June 2016. ↑ "Kriti Sanon to endorse a cola brand". Times of India. 6 June 2014. Archived from the original on 9 June 2014. Retrieved 11 July 2014. ↑ "Kriti Sanon: The Next Brand Beauty". India Glitz. 11 July 2014. Archived from the original on 2 August 2014. Retrieved 11 July 2014. ↑ PTI (2 July 2014). "I am doing a Telugu film now: Kriti Sanon". Zee News. Archived from the original on 8 July 2014. Retrieved 11 July 2014. ↑ "IPL 2017: Kriti Sanon gives Disha Patani a run for her money with brilliant performance in Bengaluru opening ceremony". Zee News. 9 April 2017. Archived from the original on 10 April 2017. Retrieved 9 April 2017. ↑ Rakshit, Nayandeep (11 August 2018). "Kriti Sanon shoots her first item number for 'Stree'". Daily News and Analysis. Retrieved 12 August 2018. 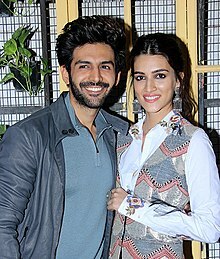 ↑ "Kriti Sanon wraps up shoot for Luka Chuppi, co-starring Kartik Aaryan; film to release in March 2019- Entertainment News, Firstpost". Firstpost. Retrieved 2018-09-19. ↑ Coutinho, Natasha (31 May 2018). "Kalank: Kriti Sanon to grove with Varun Dhawan, Aditya Roy Kapur in a special song". Mumbai Mirror. Archived from the original on 16 June 2018. Retrieved 31 May 2018. ↑ "Farah Khan shares pic with Housefull 4's Kriti Sanon, Kriti Kharbanda, Pooja Hegde". Hindustan Times. 14 July 2018. Archived from the original on 2 August 2018. Retrieved 2 August 2018. ↑ T-Series (16 July 2015). "Chal Wahan Jaate Hain Full VIDEO Song - Arijit Singh - Tiger Shroff, Kriti Sanon - T-Series". Archived from the original on 2 April 2018. Retrieved 24 March 2018 – via YouTube. ↑ T-Series (8 July 2017). "Paas Aao Song - Sushant Singh Rajput Kriti Sanon - Amaal Mallik Armaan Malik Prakriti Kakar". Archived from the original on 31 July 2017. Retrieved 24 March 2018 – via YouTube. ↑ Sen, Sushmita. "The Vogue Beauty Awards 2014: Sidharth, Parineeti, Kangana, Rujuta Honoured". International Business Times, India Edition. Archived from the original on 14 December 2017. Retrieved 13 December 2017. ↑ "Nominations for SIIMA Awards 2015 - Telugu". Filmibeat. 16 June 2015. Archived from the original on 17 June 2015. Retrieved 16 June 2015. ↑ "Nominations for Stardust Awards 2014". Bollywood Hungama. 8 December 2014. Archived from the original on 13 April 2017. Retrieved 8 December 2014. ↑ "BIG STAR Entertainment Awards 2014 Winners List". Pinkvilla.com. 18 December 2014. Archived from the original on 19 December 2014. Retrieved 25 December 2014. ↑ "Winners of Big Star Entertainment Awards 2014". Indicine.com. 19 December 2014. Archived from the original on 20 December 2014. Retrieved 25 December 2014. ↑ "Crowd Favourites". The Indian Express. 3 January 2015. Archived from the original on 3 January 2015. Retrieved 5 January 2015. ↑ "Celebrating the Elle Graduates Of 2015". Elle India. ↑ "Filmfare Glamour and Style Awards 2017: Winners List". The Indian Express. ↑ "HT India's Most Stylish Awards 2018: Winners". Hindustan Times. ↑ "Shahid Kapoor, Kriti Sanon Receive 'Nothing To Hide' Award. Twitter Goes ROFL". NDTV.com. Archived from the original on 16 April 2018. Retrieved 16 April 2018. 1 2 "Winners Of Lux Golden Rose Awards 2017 - Eastern ye". Eastern Eye. 11 December 2017. Archived from the original on 24 March 2018. Retrieved 25 March 2018. ↑ "Zee Cine Awards 2018: Check out the nominations list | Free Press Journal". www.freepressjournal.in. Archived from the original on 14 December 2017. Retrieved 13 December 2017. ↑ "Hello Hall of Fame Awards 2018: Ranveer, Deepika win big, Shah Rukh Khan adds his charm. Here's the complete winners list". The Indian Express. 12 March 2018. Archived from the original on 13 March 2018. Retrieved 12 April 2018. ↑ "Kriti Sanon to receive Dada Saheb Phalke Excellence Award for Bareily Ki Barfi". mid-day.com. 13 April 2018. Retrieved 1 July 2018. ↑ "IIFA 2018 Awardees". Archived from the original on 25 June 2018. Retrieved 29 June 2018. Wikimedia Commons has media related to Kriti Sanon.